January 7, 2010 by Laurie 2 Comments This post may contain affiliate links, which means if you click on a link and purchase something, I may earn a small commission (at no additional cost to you.) See my disclosure policy HERE. 8 ounces corn tortilla chips FREE PENNY ITEM! Put all ingredients except tortilla chips, cheese, and sour cream in pot on stove. Bring to slow simmer, then cook on low for 20 – 30 minutes. 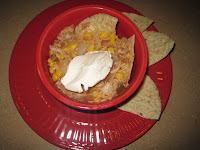 Put tortilla chips into individual bowls and pour soup over chips. Top with cheese or sour cream and a few more chips! To make this a little lighter, omit chips, cheese and sour cream. Could you tell from the photo that we had some sour cream at our house tonight? I skipped the cumin, used frozen Birdseye Steamfresh Super Sweet Corn, and since I didn't have any chicken broth I just boiled 4 cups water with bouillion cubes. YUMMY!!!! Thanks to I Heart Publix, Two Thrifty Sisters, and Hot Coupon World for the coupon matchups, and All Recipes for the recipe idea! I just found this great website that calculates the calories when you put the ingredients in, and without chips or toppings, this soup has just 154 calories per serving, 3 grams of fat and 2.6 grams of fiber. Not bad!! See this awesome calorie counter HERE.